For those of us still pining for 70s and 80s post-punk, Sanchez 77 brings us nostalgic beats with a modern twist. Sprinkle in some really thoughtful lyrics and you’ve got one killer high-energy, post-punk E.P. We had a few burning questions for the two men behind the new E.P. Scribble Republic. Here’s what Sanchez 77 shared with us. NA: What’s your band’s story? Sanchez 77: We both grew up in Birmingham, UK and went to school together in the 1990s. It was an exciting era for music yet we were both happier listening to the punk and new wave sounds of the late 1970s. It was natural that we’d end up in a band together, although the first one we were in while at college was more the indie sound of the time (late 90s) and it’s only now that we have used the musical influences that we grew up with. 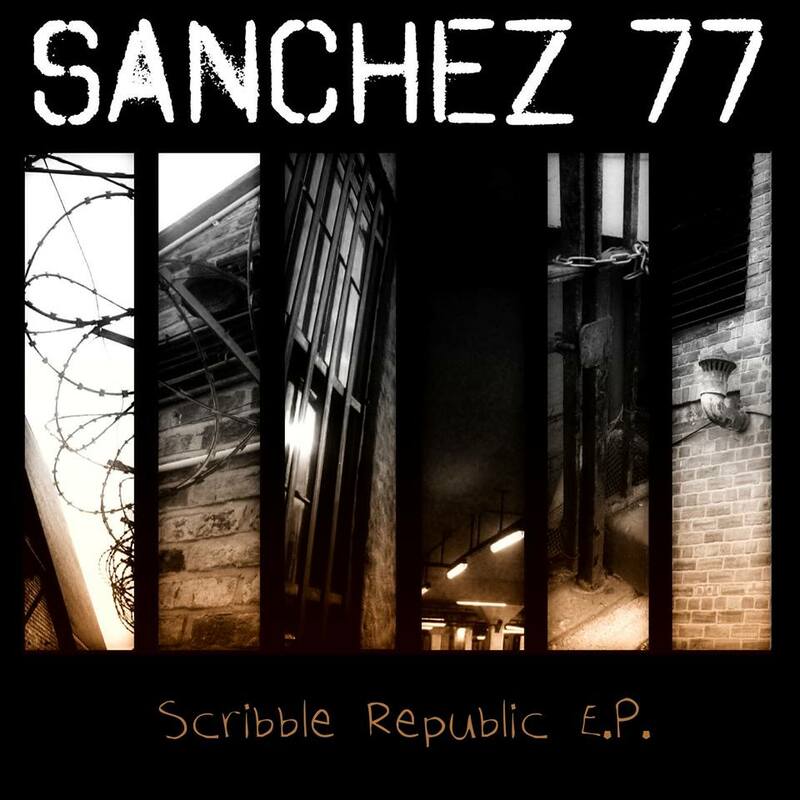 Sanchez 77 is a brand new project but we have kept in touch since school keeping an eye on each other’s progress with other bands and projects along the way. The only change really is that we thought we’d have about two or three songs ready by the agreed release date. The fact we ended up with six strong songs was a bonus! NA: How would you describe your sound? How did you decide what kind of music to play? ALEX: Both of us had loved punk music since school, but had never really had the chance to form a punk band. Paul then heard the Adam & the Ants, “Peel Sessions,” last year and loved the sound, the feel and the energy of the music. PAUL: Yeah, I thought it was great and I immediately wanted to try and do something in that vein. I had a feeling Alex would be keen on the idea and luckily he was. It’s also allowed us to rediscover some great music from the time, as well as find out about some lesser known bands. ALEX: The intention for Sanchez 77 was to take post-punk influences from the past and create a sound that was both a throwback to that scene but also relevant and exciting to today’s audiences. PAUL: I think at one point we said it should be like the music of early Wire with the vocal style of early Adam & the Ants and that is sort of true, but naturally things evolve along the way. NA: What are your musical backgrounds? PAUL: I was singing at an early age and often got the good parts in school plays and was in choirs and all that. I didn’t bother so much in my teens and didn’t really push it. It wasn’t until college when other people said I was a good singer that I thought I should do something about it. I have since been involved with several projects from one-off vocal guest appearances to full blown album releases in a variety of genres. I am a big music fan so I try and push myself to try different styles. ALEX: After playing rhythm guitar in college-indie band Fragile X with Paul, I took a break from bands and started writing and recording music at home. A few years later I wanted to rejoin the band and gigging scene, so formed alt-rock band Negative Brody, taking the role of rhythm guitarist and music-writer. Despite regular line-up changes the band played loads of gigs in the Midlands area and recorded a few demo CDs before coming to an end in 2012. After that I joined a covers band formed specifically for a friend’s birthday party, which has only played two gigs but allowed me to have a bash at bass guitars and drums, so I’ve got more involved with the bass and drum programming with Sanchez 77 as well as play guitars. I’ve always wanted to be in a punk band so jumped at the chance to be involved here. NA: If you could pick any musician, living or dead, to play with, whom would you pick and why? PAUL: I like unusual and quirky performers. I think Björk would be really interesting to work with. A true artist. ALEX: Easy. Joe Strummer. Two words: energy and passion. NA:What is the story behind the song Sibyl Vane? There are a lot of mixed literary references. Is there someone in the group who is passionate about reading? Is this song a work of fiction or inspired by someone in real life? PAUL: As I am responsible for the lyrics, I will answer this one… Sibyl Vane could be taken as a song about the literary character (from “A Picture of Dorian Gray”) but in reality it’s about appearances in society. She can only exist by playing the parts of others on stage and when she is called upon to be herself she cannot function. I think there is a lot of fakeness in public often brought on by the celebrity-obsessed culture we live in. The song is sort of saying there is no need to hide behind a persona or the expectations of the world…just be yourself! Likewise the librarian character (in bonus track “Never Date a Librarian”) is basing her existence on the characters in books. It’s all about identity and it’s a constant theme throughout our EP. NA: Describe your creative process. ALEX: With five of the six songs on the E.P., I wrote and recorded an instrumental demo, sent it to Paul who has written lyrics and melody and suggested any musical changes. Much debate and tweaking then ensues! PAUL: The exception was “The Wrong Club,” which I wrote a basic structure for on keyboards, which Alex then transposed to guitars. I always prefer having the music first, then I come up with a melody, and then write the lyrics to fit that. From an early stage our methods clashed a bit as Alex prefers lyrics to work from. As a result, I wrote several basic lyrics for him to come up with the music and then I would often start all over again with new lyrics or melodies afterwards. ALEX: In previous bands I’ve always written songs starting off with a guitar riff, then built the rest of the song around that, and our first song “All The Young Hipsters” was also written in this style. But with the other songs on the EP I’ve generally started with a bass riff (e.g., “Sibyl Vane,” “Never Date A Librarian”), which has led me down a different song-writing route and has produced, I think, exciting results. NA: What’s coming up for you guys? Our Scribble Republic E.P. is out now on our Bandcamp page and will be available on general online stores and streaming sites (iTunes, Spotify etc) from 10 November. We are going to release a free-to-download covers EP around January and then work on an album throughout 2015. NA:Where do you hope to be in five years? Hopefully we’ll still be recording and releasing stuff as Sanchez 77. We are delighted with the E.P. and there are plenty more songs to come. We won’t be standing still – we want to keep growing our sound and obviously the number of listeners.